The Windsor pendant light from Tech Lighting exudes sleek contemporary styling. The duel-tapered, elongated silhouette of the shade is inspired by mid-century modern design creating an alluring sense of visual dimension. The Windsor is available in your choice of either painted metal finishes or a natural cast concrete offering you a host of texture options. Scaling at 18” long and 4.5” in diameter the Windsor is ideal for task lighting applications such as kitchen island task lighting, home office lighting and bedroom lighting flaking end tables. 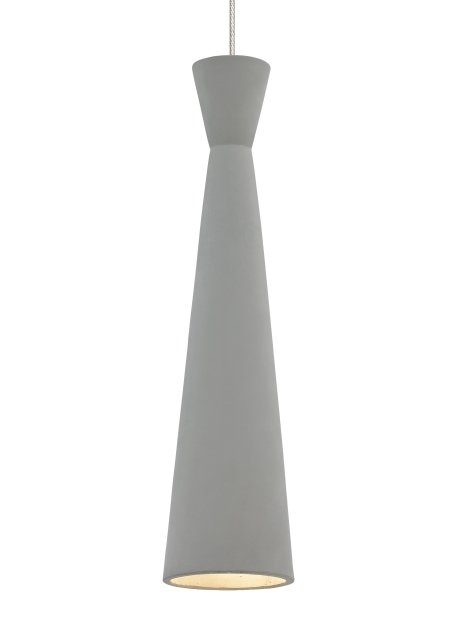 This pendant is available in low-voltage allowing for an even wider range of mounting options. Available lamping options include energy efficient, fully-dimmable LED or no-lamp, leaving you the option to light this fixture with your preferred lamping. Rated for (1) low-voltage, 50 watt max lamp (Not Included). LED includes 120 volt 8 watt, 310 gross lumens, 3000K, replceable SORAA LED MR16 lamp. Ships with six feet of field-cuttable cable. Dimmable with low-voltage electronic or magnetic dimmer (based on the transformer).